Two extremes: Chribba the noncombatant and loyalanon the ultimate combatant. If you're planning to break the Code, consider how powerful (and e-famous) its enforcers have become. Now enjoy some fine kills from the week of January 24th @ 00:00 EVEtime through January 30th @ 23:59 EVEtime. 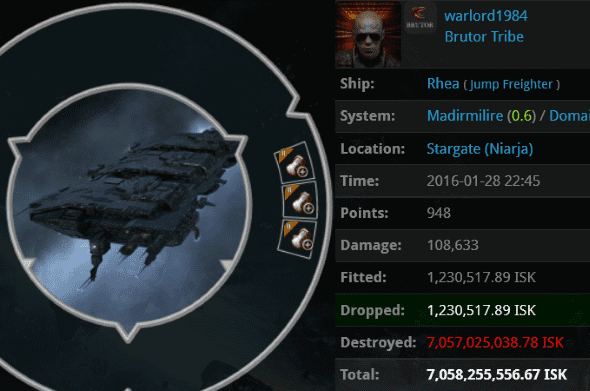 warlord1984's 7 billion isk jump freighter was destroyed by Agent Rhaegal Pavarius. Who says solo PvP is dead? Actually, Rhaegal had a little help from a friendly bumper. 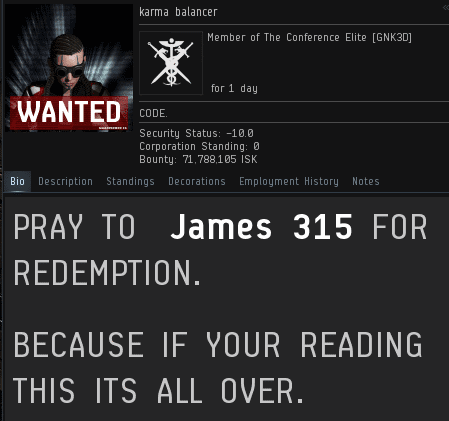 When ransomed by the bumper, warlord1984 claimed he'd just returned to EVE (as if we haven't heard that one before) and that he only had a Rhea and 397 million isk. 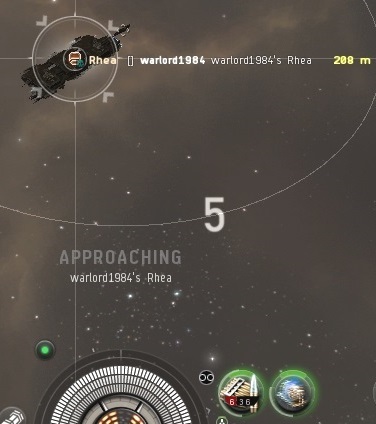 He surrendered the isk, but then went silent for some reason. Luckily for the jump freighter pilot, he was contacted by an Anti-Ganker who offered to web his ship and get him to safety. As payment, he only requested a small tribute, which warlord1984 was happy to provide. 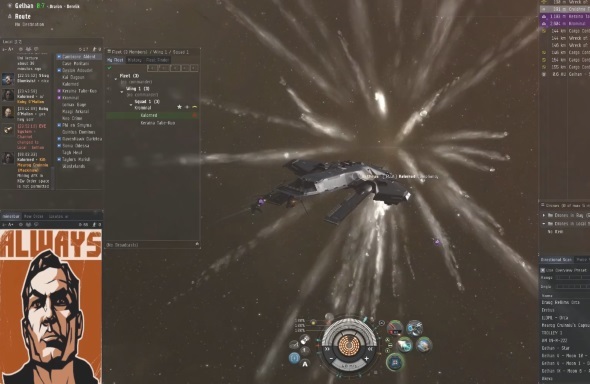 A stroke of bad luck: The Anti-Ganker didn't have a web on his Hurricane; he only had a warp disruptor and some guns. So he used those instead. When all you have is a hammer, every problem looks like a nail. The jump freighter pilot wasn't happy about this turn of events, so he initiated self-destruct in a vain attempt to avoid generating a killmail. Gee, maybe he really did just return to EVE? 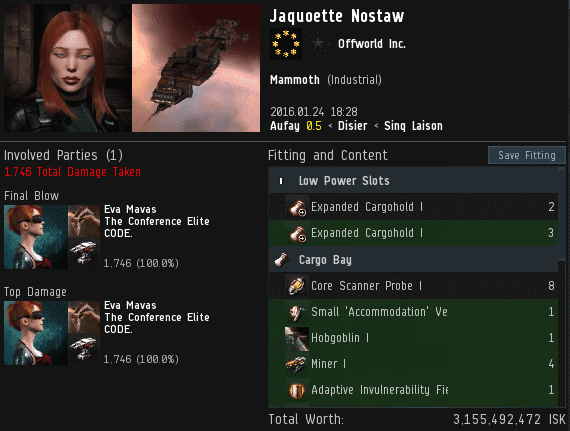 Jaquoette Nostaw had over 3 billion isk of cargo and a paper-thin industrial ship. She had no permit and no desire to play EVE while at her keyboard. The predictable ensued. 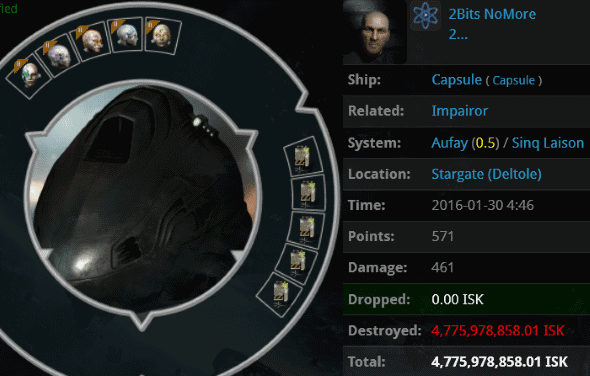 Agent Eva Mavas destroyed the Mammoth along with the 1.2 billion isk pod it dropped. What's worse than an anti-tanked mining battleship? CATSSS had the answer: A capacitor tanked mining battleship! He probably thought it would be silly to use cargo expanders on a battleship. I mean, what good would the extra cargo space be, if he ran into a group of suicide energy neutralizers, for instance? But Agents Pod-Goo Repairman, Aaaarrgg, Pod-Goo RepoWoman, and FightMeNow weren't armed with neuts or nosses. They were armed with the Code. Protip: If local chat starts focusing on your mining battleship, the opinion of Agent Aaaarrgg is the one you should listen to. 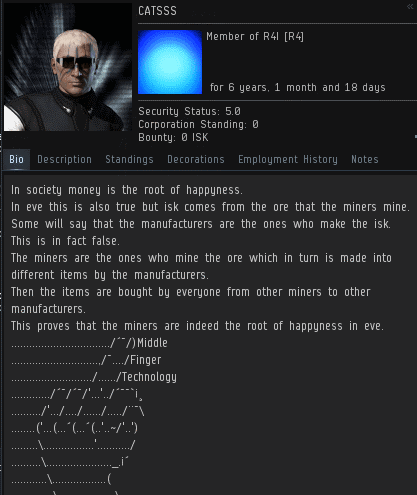 If mining and isk are the root of happiness in EVE, then why are all the miners we encounter so unhappy? Cholo Asis got a pass last week, but in light of the cap-tanked 'Geddon, this Talos demands our attention. Agents Eva Mavas and Lucia had no choice but to destroy the hull of what could otherwise have been a fine ganking ship. Instead, it was fail-fit with medium railguns(?!) and a capacitor tank. Carebears, stop it. Htorm Ormand had a bundle of capital blueprints and desperate need to get them through Uedama. She could've requested the assistance of the New Order (who knows highsec better than we do? ), but she chose to ignore our existence. 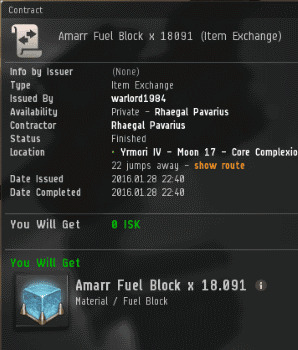 19.3 billion isk later, she hopefully learned that bigger isn't always better. Capital ships are nice, but they are nothing compared to the Code. Codier is always better. Agents Bob Painter, HipHop Music SMDH, Sasha Cohenberg, BoneyTooth Thompkins ISK-Chip, Oryae Veris, Giggles McGiggler, Ilsanore Lea, ZAKURELL0 LINDA, Fabulous Andy, Ricki Lake Show, RAGE QUIT, The Proctologist, Pure Whyte, The O'Reilly Factor, EveIs ABadGame PleaseQuit, Justin Kusion, Shazna Solta, Joel Kusion, Jayson Kusion, Jason Kusion, Jake Kusion, Dejah Red, Jayden Kusion, Joshua Kusion, Kasheem Cetanes, Johnathan Kusion, Jackson Kusion, Joseph Kusion, Inspector Implant, Jeremiah Kusion, Darnoth, and Angry McAngerson could all have helped this freighter pilot. Too bad none of them were consulted, and they ended up on the opposing side. 2Bits NoMore was just another harmless newbie autopiloting in a rookie ship. Or so he wanted everyone to think. Agent Lucia didn't care about appearances. She's not superficial like that. Like any good Agent, she looks into the heart of another EVE player and forms a judgment based on substance. Her instincts proved correct. 2Bits was equipped with a High-grade Ascendancy set and a lot of other expensive stuff. Lucia wouldn't allow 2Bits to abuse highsec anymore. Decadent carebears, take notice! Well, it was fun while it lasted. We finally ganked bemaa, thereby putting an end to the New Order. Thanks a lot, John E Normus. Highsec powerhouse Ranger Balk was ganked, too. Just when you thought things couldn't get any worse! Somehow, the New Order is still intact. Maybe all of our adversaries got into a big traffic jam with each other or something. Sigh. It's hard to imagine anyone writing more words than I have to explain their motives for what they do in EVE. This is like handing George Washington Carver a peanut and asking, "Got any ideas?" More wisdom from the Anti-Ganking channel. As an accessible Saviour of Highsec, I have an open door policy. I generally accept convo invites from strangers. But as any intelligence agency will tell you, most walk-ins offer little of value. Another of my candid remarks that will end up costing me, no doubt. Of all the Russian miners who write tearmails in broken English, my favorite are the ones who include the word "creature" somewhere in the text. I'm not sure what the deal is, but apparently it's one of Google Translate's quirks. I call these "creature features". In a word, the New Order represents progress. It comes in many forms, as you can see. The Code liberates women. Before the Code, highsec culture was so backward. Just another friendly miner. Mining is relaxing. Reater Maulerant claimed to have quite an arsenal at his disposal. But was he telling the truth? Hmmm. Must be 700 confirmed kills in real life, then. 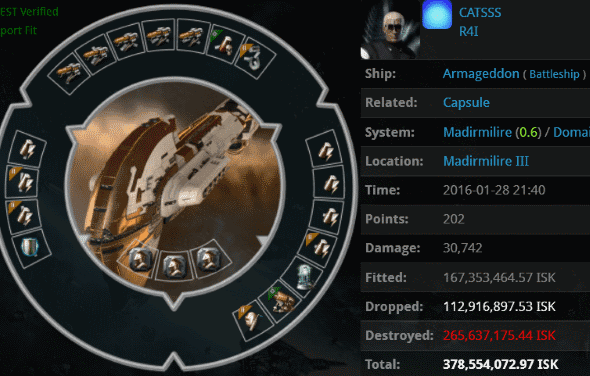 For those who return after having been away for a few years, EVE is a whole new game. There may be fewer subscribers, but look at the quality of the content! Unlike the greedy carebears, who only think of themselves in the present moment, the New Order is always planning for the future. As Origo Lim will tell you, it's never too early to teach your child about the Code. At this point, I'd like to add that MinerBumping is a great resource for teaching your child how to read. However, please be aware that since we report on the activities of highsec carebears, the occasional profanity is to be expected. On the plus side, if it's inevitable that your kid is going to discover curse words, he may as well learn them in both English and Russian. The rebel asks, "Why doesn't the New Order ever shoot ships that can shoot back?" Answer: We're too busy shooting ships that can shoot back. The Derelik region owes much to Agent Kalorned and his alts. Can you imagine what that place would be like, if the Code had never arrived? Let's just be glad it did. Spoken like a true businessman! 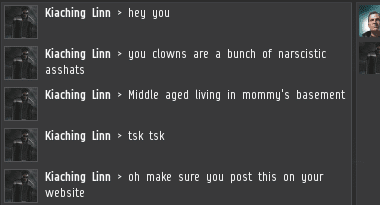 I hold the curious distinction of being, by far, the most speculated-about player in EVE when it comes to being someone's alt or someone else being my alt. Though I have only ever had one account, there's an element of truth in the speculation when it comes to my Agents. As the duly-elected Saviour of Highsec, I am the living manifestation of the Code. Wherever my Agents enforce the Code, there I am also. Bing Bangboom has renewed his slow, steady climb up the shareholder ranks. 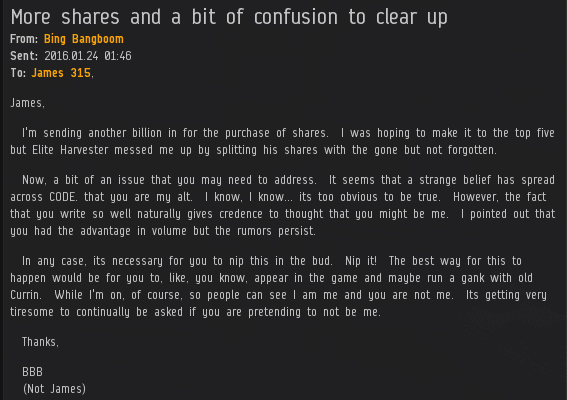 His latest purchase of 1,000 shares sent us over the 851 billion isk mark and earned him a Supreme Protector's Tip of the Hat™. Meanwhile, Tora Bushido submitted an order for 1,500 shares, adding to his surprisingly healthy supply of New Order stock. 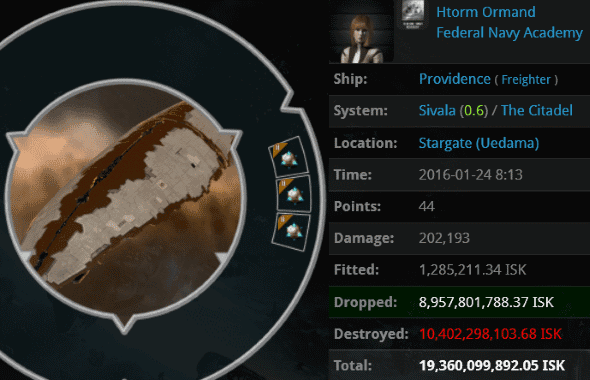 This sent us over the 852 billion isk mark and earned Tora a Supreme Protector's Tip of the Hat™. Finally, Alexander Sikorski joined the ranks of the business world's elite when he signed on for 315 shares. 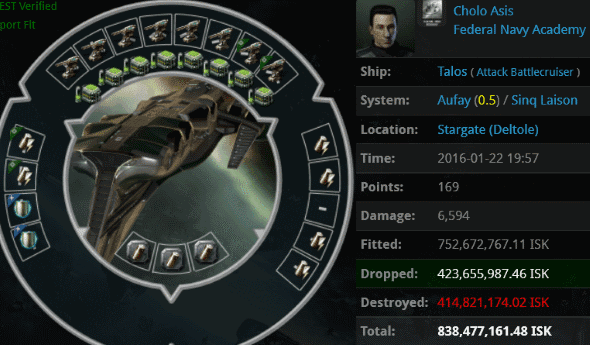 Alexander sent us over the 853 billion isk mark and earned a Supreme Protector's Tip of the Hat™. 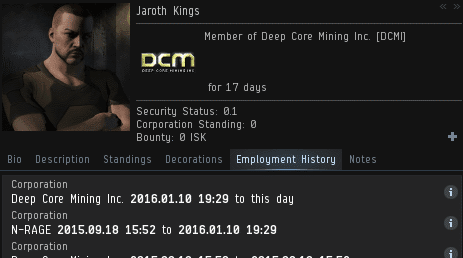 Previously, on MinerBumping... Jaroth Kings' angry outburst, directed against ganker Liek DarZ, sparked a major diplomatic crisis. Agent Liek called upon Jaroth's CEO, wabbitrage, to either extract a public apology from Jaroth or expel him from the corp. But matters were complicated by the fact that Jaroth was wabbitrage's real-life cousin. wabbitrage felt his other corpmates, many of whom were also his relatives, wouldn't understand. Tensions escalated when Agent karma balancer suddenly appeared and demanded action. War became increasingly likely. wabbitrage knew it could spell the end of his corp's existence, but at least he wouldn't need to take sides against his family. In this situation, karma is what is known as a "heavy". Liek understood wabbitrage's dilemma: He was torn between his real-life family and the New Order family. The time comes in every highsec CEO's life when he must make a principled decision. I.e., one in favor of the Code. In a last-ditch bid to prevent a ruinous wardec, wabbitrage offered to guarantee the Code-compliance of everyone in his corp. 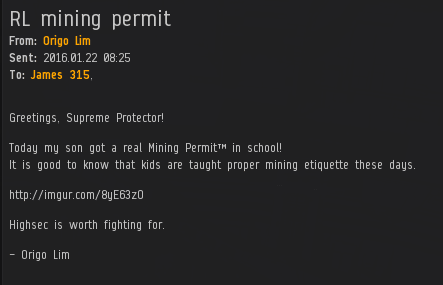 He'd buy additional mining permits, even for those members who didn't reside in highsec. 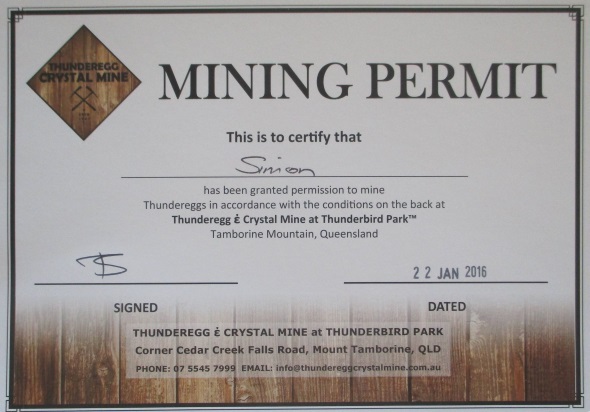 Our Agents are always happy to sell more permits. Yet the Jaroth problem remained. wabbitrage offered to pay Jaroth's Red Pen fee. An apology was still required, however. Liek DarZ is, like all of our Agents, a problem-solver at heart. He came up with an intriguing solution: wabbitrage could kick his cousin out of the corporation and let him back in once he apologized. That would put all the onus on Jaroth. To hammer out the details, the two Agents and wabbitrage discussed the matter on TeamSpeak. Though tense at times, the conversation was a productive one. 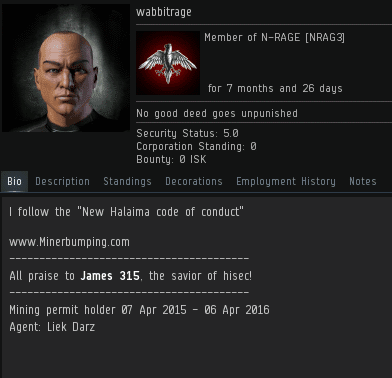 wabbitrage agreed to buy permits for everyone, instruct them all to pledge allegiance to the Code in their bios, and put a Code-compliance statement in the corp's description. From now on, the corp would be for New Order loyalists only. Liek received the payments and oversaw the changing of wabbitrage's corp's description. Now it was up to Jaroth to apologize. wabbitrage felt an enormous sense of relief. His family members might not be thrilled by the direction things were going, but catastrophe had been averted. wabbitrage's cousin was stripped of his roles so that he could be expelled from the corporation. Within a day, the corp would be cleansed. Unfortunately for Jaroth Kings, he never found it within his heart to apologize. Instead, he remained cut off from his family's corporation. It was a difficult situation for wabbitrage, but he knew he'd done the right thing. The Code is thicker than both blood and water. In truth, there is only one family in highsec--the New Order family. And its Father smiles upon all who comply with the Code. Previously, on MinerBumping... Agent Liek DarZ killed Jaroth Kings, a non-compliant miner, and was treated to a number of impertinent remarks. Liek contacted permit-owner wabbitrage, the CEO of Jaroth's corp. In a private conference, the Agent discussed with wabbitrage what could be done about the wayward miner. Liek couldn't help but feel resistance on the part of the CEO to do what needed to be done. Liek was as diplomatic as possible. He didn't want to make wabbitrage feel uncomfortable. And yet, both men knew that if matters weren't handled properly, a wardec was a very real possibility. wabbitrage was in an awkward position--one that many highsec CEOs find themselves in. He didn't want to alienate his corp members or show weakness in front of them, but he absolutely could not afford to face the wrath of CODE. The CEO had bad news: He was sure that the miner wouldn't apologize. Violent conflict seemed inevitable. However, his corp could avoid punishment if he expelled Jaroth. In the end, the Code will unite all highsec. Until the day of final victory comes, the Code can also divide people: Cousin against cousin, brother against brother, Goofus against Gallant. Liek DarZ had compassion for wabbitrage. The CEO was forced to choose between his real life family and the New Order family. The burden of leadership can be a heavy one. wabbitrage felt the weight of the world on his shoulders. Should he remain loyal to his blood relations--those to whom he was bound by the accident of birth--or should he remain loyal to the time-tested principles of the Code? Liek urged wabbitrage to do the right thing. We all knew what we signed up for when we subscribed to EVE. wabbitrage's sadness and regret was palpable. He couldn't bring himself to kick his cousin out of the corp. If Jaroth didn't apologize, they would be pushed to the brink of war with the New Order--a war wabbitrage couldn't hope to win. Communications were reopened. Unfortunately, tensions had only escalated in the meantime. Agent karma balancer had learned of Jaroth's insults and was brought into the conversation. You might say that karma balancer was cast into the role of "bad cop". But there was nothing feigned about karma's indignation when she heard about the offense committed against a fellow Agent. wabbitrage urged the Agents to believe that he had done everything possible to keep his corp compliant. He claimed he'd always been loyal. It was a disaster, and wabbitrage knew it. The whole world he'd built in EVE was crashing down all around him. In this desperate hour, wabbitrage could only hope against hope that there was some way out of his dilemma. The war drums were beating.